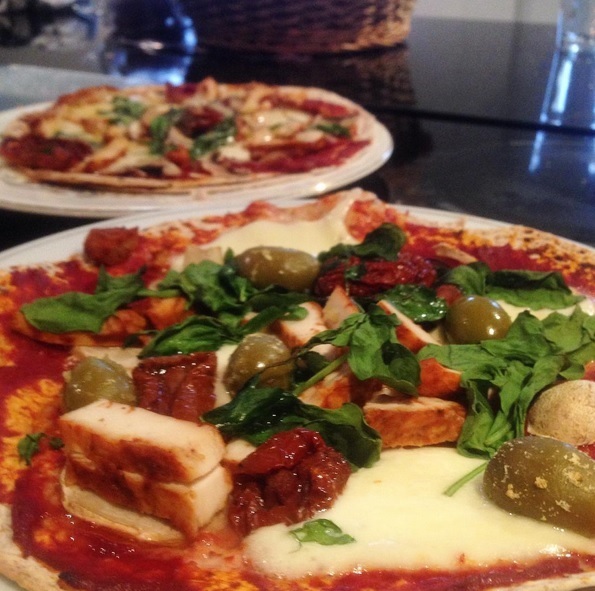 No stodge, healthy pizzas – yes you heard me! Oh pizza! You can be a calzone, a deep dish or a crispy thin creation and I’ll still love you no matter what. However you’re served up you’ll always hold a special place in my heart! So as you can probably tell, I love pizza! In my quest to be able to eat them a couple of times a week I’ve come up with this recipe. This pizza is low carb and you can make it as healthy as you desire. We’ve all been there when we’re looking at a menu in a restaurant and like the toppings on one but want to add some from another but with this recipe you can! You’re in control of what you want to throw on there so go ahead and chuck on whatever toppings your heart desires! That said, these are meant to be healthy pizzas so you are in control of how healthy you make them as well. These actually feel as though you’re eating a “real” pizza with a delicious thin and crispy base topped with plenty of tasty offerings; you forget you’re not tucking into the real thing. Another plus is that they take no time at all to make and bake. – Basically any toppings you want! I topped mine with chicken, olives, sundried tomatoes and loads of veggies. – Pre-heat the oven to about 180 degrees. – Get a wrap and spread the tomato purée all over one side of it followed by a few slices of mozzarella. – Add the rest of your toppings. – Pop the wrap on a foil covered baking tray (this just lets it slide off and on to your plate more easily) and bake in the oven for about 12-15 minutes until the wrap has begun to crisp up and the cheese has melted. Voilà, that’s literally it! Enjoy your pizza and let me know what you like to top yours with! They also make the perfect post-work out snack if you add some protein powder to them, making them the perfect balance of protein and carbohydrates. If you top them with some honey or golden syrup you’re making the most of that recovery window where it’ll go straight into your muscles to refuel rather than to be stored as fat! 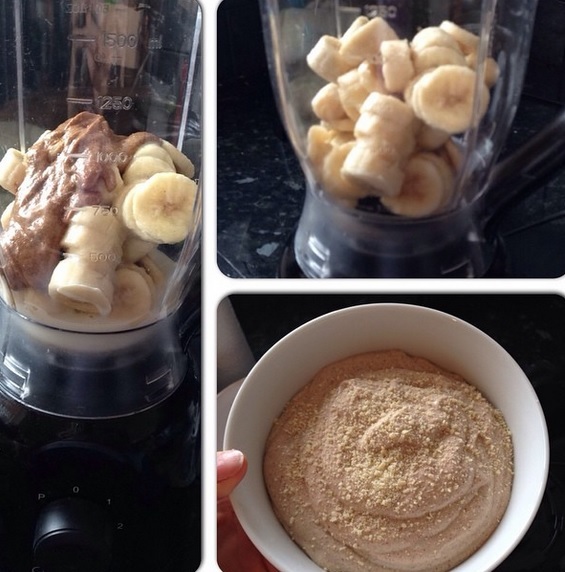 – Mix all of the ingredients together in a blender or by using a hand blender. – Put a dollop of your chosen oil ( I use coconut oil) into a pan on a low heat and when the oil has melted add a spoonful of the mixture to the pan. – Flip the pancakes when you see the surface begin to ‘set’/bubble. 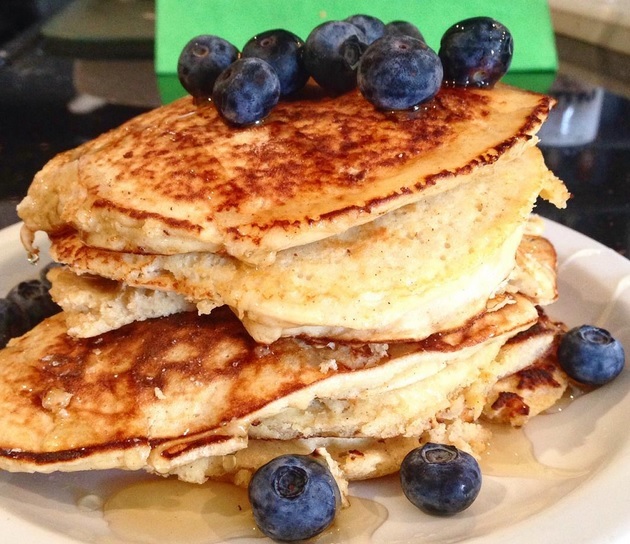 Stack them up and then add whatever toppings you fancied. – I like to top mine with honey, blueberries and peanut butter! Tag me in your creations using #hannahshappypace and let me know what you top yours with. If there’s one food that’s extremely versatile it’s avocado. This homemade guacamole is super easy and quick to make and can be used as a dip, added to your lunch, spread on wraps or as a garnish on certain dishes. 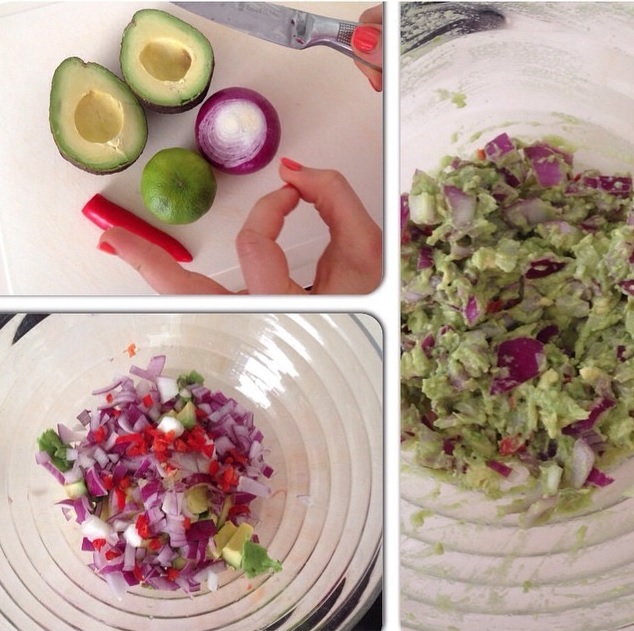 – Start by finely chopping the chilli and red onion and put into a bowl. – Peel and dice the avocado and add to the bowl along with the black pepper for seasoning. – Next add the juice of one lime and mash together with a fork. – If you want to add tomatoes I’d recommend a variety of red and orange ones. Simply chop finely and add to the mixture as well. – Voilà – homemade guacamole ready in a flash! Looking at the picture on the left you could easily mistake it for a pan of pesto covered spaghetti yet it’s actually one of my favourite “pastas”, courgetti! Thanks to my handy little spirazlier (which you can spend as much or as little on as you want – mine was £13 from Amazon) I’m able to transform this underrated vegetable in to yummy ribbons of courgette as a substitute for pasta. The outcome is a light dish which has the same texture as spaghetti and is quicker to cook than pasta – I love it. Another food I love is fish and it goes great with courgetti which is how this dish was created. The recipe uses fresh, clean ingredients that are easy to get hold of and the entire dish can be made in less than 40 minutes. Healthy eating doesn’t need to be overly fancy and involve lots of ingredients you can barely pronounce, just eat good stuff! Also, this dish is ridiculously tasty! – Start by preheating the oven to about 180 degrees and wrap the salmon in some tin foil before putting in the oven to cook for about 18-20 minutes. – Heat a tsp of coconut oil in a frying pan and add the chopped garlic, cherry tomatoes, vine tomatoes and chopped chilli. After a couple of minutes add the tomato purée. – When the salmon has been in the oven for about 10 minutes put the kale on a baking tray and drizzle with a little oil before putting in the oven to roast for about 10-12 minutes – be careful though as it does crisp up quickly. 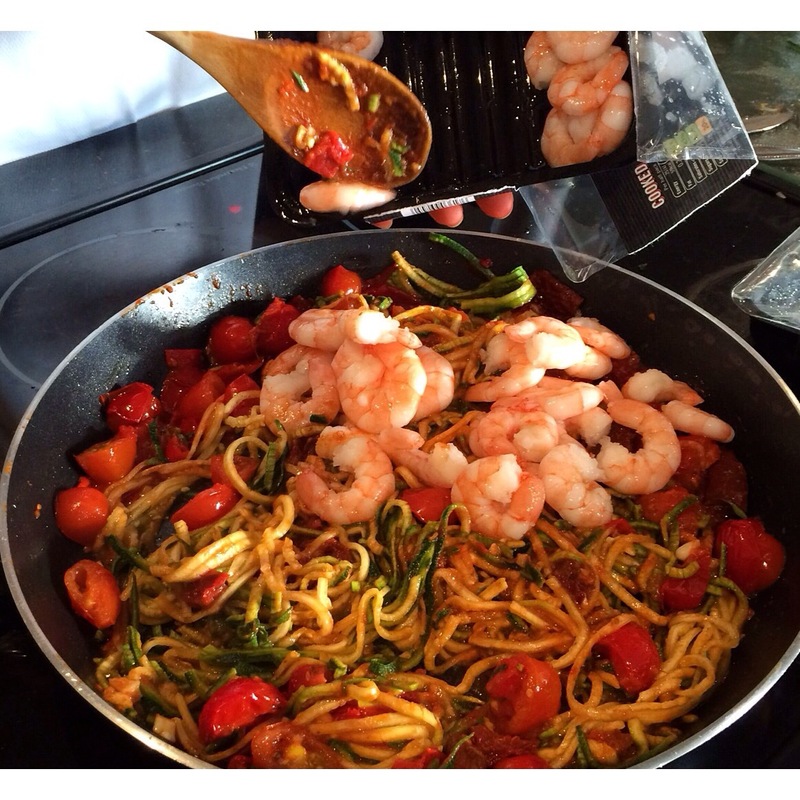 – Add the spiralized courgetti to the pan and stir in the pesto, king prawns and chopped coriander. 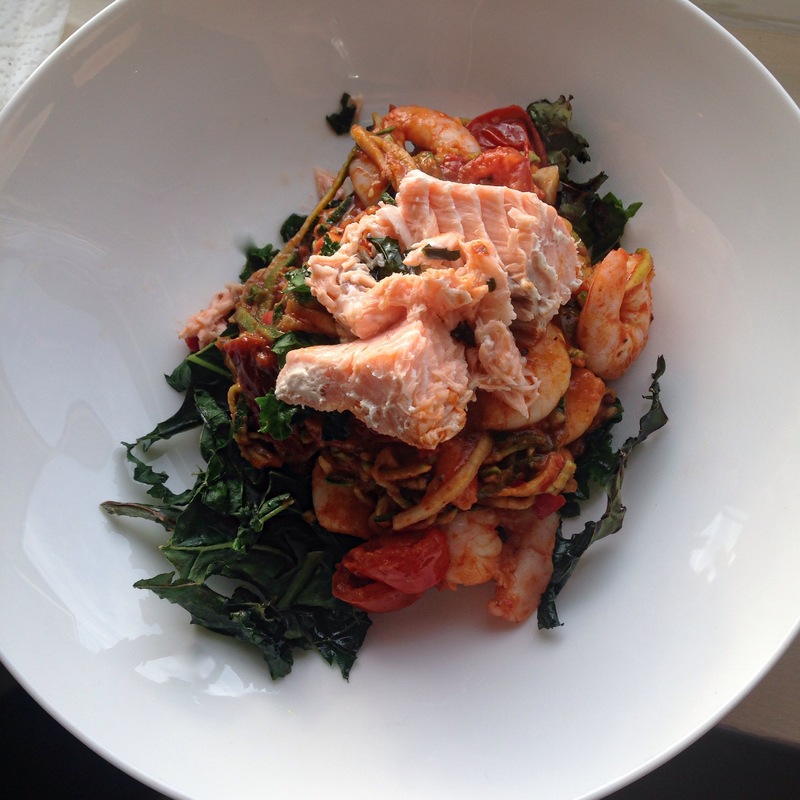 – Once everything is ready, put the kale in a bowl then add the courgetti pasta and top with a piece of your salmon fillet. Got a courgetti recipe you want featured? Contact me! 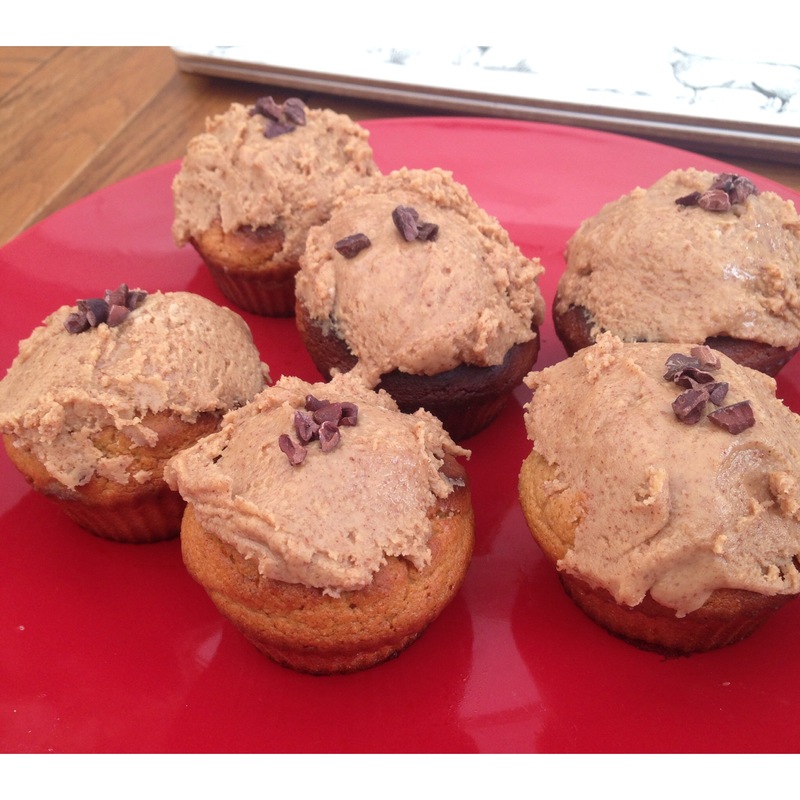 Muffins? Love. Eggs? Love. 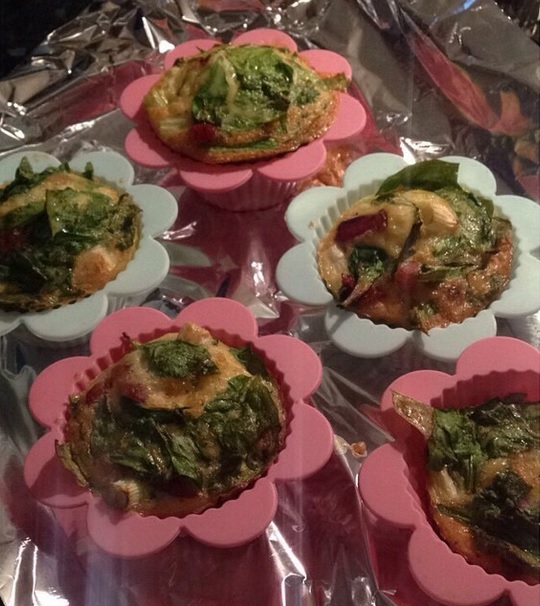 Egg muffins? GO ON THEN! Many of us don’t have the time/would prefer not to make eggs in the morning so these are the perfect portable breakfast to have on the go or as a snack or lunch accompaniment. 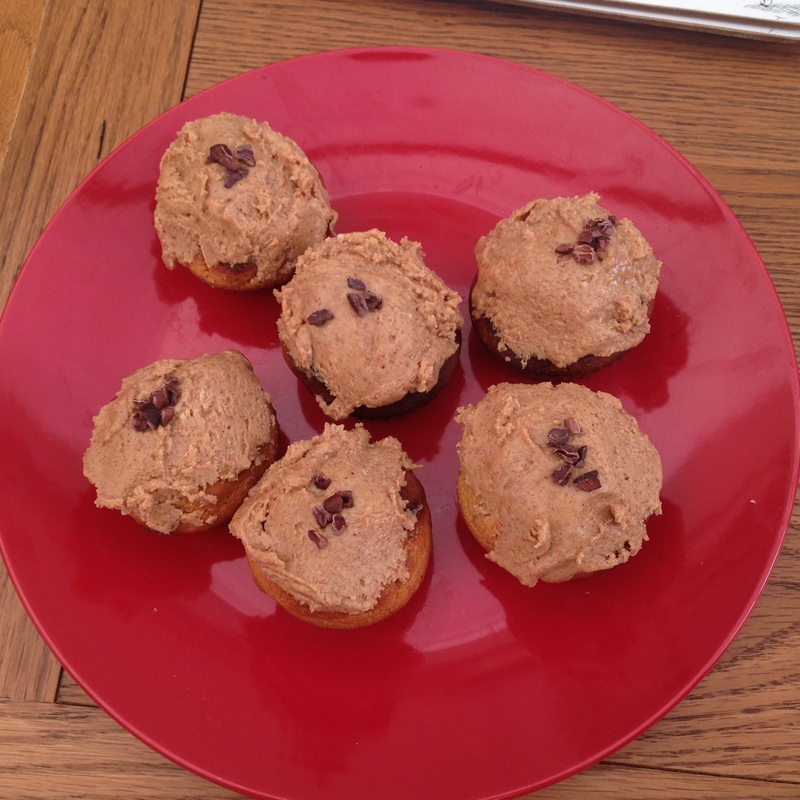 Boasting the density of a muffin and all the protein benefits of eggs, this is a super easy and tasty recipe to rustle up when you’re doing your food prep. Not only that but it’s another way of getting your greens in first thing in a morning. If you’re someone who can’t stomach the thought of broccoli for breakfast (personally I love it morning, noon and night!) then this is a great way to get those vitamins and nutrients in your system in a creation which actually tastes amazing too. You can keep these egg muffins in the fridge, heat them up or simply eat them cold. My recipe below used the ingredients I had in the fridge at the time but you can add chorizo, salmon, sweet potato… basically anything you like – give it a go and let me know what you use. – Crack the eggs in to a jug or a large bowl and whisk with a fork as though you’re going to make scrambled eggs. – Add the pepper and other spices as well as the rest of the chopped ingredients and stir well. – Pour the mixture into muffin cases or a Yorkshire pudding tray, basically anything that’s deep enough to hold the mixture and put it into a pre-heated oven at about 180° for 20-25 minutes until cooked.